Could there be possibly such a profound difference between horse people? What is it really that a knight applies to be with his horse? If you are watching Klaus Ferdinand Hempfling, working with horses you quickly see and feel for yourself that there is something you can not quite put your finger on. It is intriguing, challenging but at the same time calling you forward to a place which most of us have only found in our dreams. So really, what is it about this man with the name of Klaus Ferdinand Hempfling that truly sets him apart from the rest? I would like – briefly – take you down the road of what is, and has been. Horses have been used to help us to make our life easier by carrying us or pulling things for us etc. Mostly horses have been hit and forced into submission in a very physical way. Then a change in thinking and society made us look at horses completely differently, all of a sudden we realised that a horse is maybe more than just a means to an end. Still the enormous power of a horse was there but we did not want to use physical means to control it. 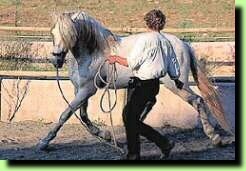 We developed a new medium using the horse’s psyche to find a more subtle mean of controlling it by manipulation. Klaus Ferdinand Hempfling approaches the horse in a completely different way, even though it might look similar. His approach is to first characterise the horse. In his book “What Horses Reveal” he reveals to his readers how he sees the horse and its character. Knowing who he has in front of him guides him to take the first appropriate step to the first encounter with this dignified creature. Klaus Ferdinand Hempfling takes his queue from the horse – moment by moment – and interacts accordingly to create a platform for the horse to shed its armour and traumas, and transform itself into its authentic, natural state of being – becoming alive, showing its beauty, and finding its own strength. When then Klaus Ferdinand Hempfling invites the horse to dance with him the audience is taken by the sheer magic of the moment. And something has been touched within each and every one – forever! Needless to say that this is the reason why his first book “Dancing with Horses” had an instant world wide success and is a long standing and best seller in the horse world. Many people travel thousands of kilometres to see this man work live, to be trained by him, to get a feel for this magical energy that transforms the world. His recent workshop saw people from 21 nations lining up on a small island in Denmark to be taught on “How to be with your Horse”.